Miss Lucy as a 1 year old Staffordshire Bull Terrier – Viszla cross. She’s 7 now; is she as silly as ever? We can only hope. More silly Lucy at dailypuppy.com! It’s hard to pick just one of Alki’s photos from Daily Puppy, so you should go look at her album. There is an epic tail of fetch, and lots more smiles. Alki the Staffordshire terrier lives with her mom Samara and tons of dogs and cats in Pulloxhill UK, where she chases the tennis ball or football all day! 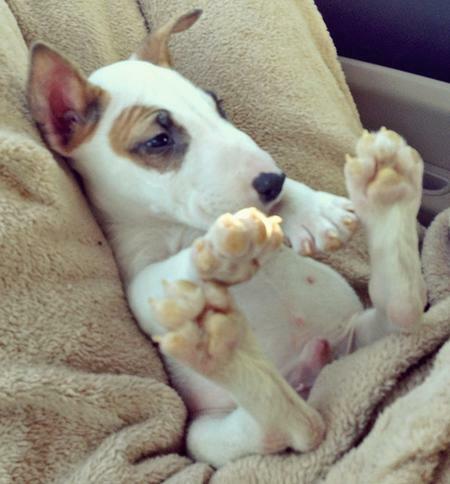 From our friends at Daily Puppy, it’s Marv, who his people describe as “kangaroo-footed pup who loves trotting like a horse when he’s excited, waddling like a penguin when he’s not, and sleeping like a beached whale when he’s tired. His number one past-time is sleep, closely followed by food, food, and more food. He also loves to play alarm clock by sneaking up under the covers and nibbling your nose when you least expect it.” My guess is, at 2 years old now he is still making his people laugh.